For special accommodations, please contact Olivia Fowler, 402.904.5641 or email [email protected]. There is accessible seating just off the main and upper concourses. There are 115 total wheelchair positions and 115 wheelchair companion seats in the new arena. Wheelchair accessible seats are available in all price levels for events. One companion ticket may be purchased with each wheelchair accessible ticket. Please indicate when purchasing tickets if you require accessible seating. For more details regarding accessible seating, please contact Olivia Fowler, 402.904.5641 or email [email protected]. The Pinnacle Bank Arena offers wheelchair service for guests who may need assistance to and from their seats. Wheelchair assistance is provided on a first-come, first-served basis. Due to the limited number of wheelchairs available, they may not be used as seating during an event. If wheelchair assistance is necessary during an event, please contact the nearest Guest Services staff member. Pinnacle BankArena does offer, for select shows, phonic devices to assist guests with hearing impairments. They may be checked out, for no charge, from the Guest Services Office behind Section 112. A valid I.D. is required to ensure the return of devices. Pinnacle Bank Arena is pleased to provide signed performances for our hearing-impaired guests. Interpretation services are not guaranteed for every event. However, we will make every effort to accommodate each request with appropriate advance notice. Please contact Olivia Fowler at 402.904.5641 or by email at [email protected] no less than two weeks prior to event to purchase your tickets. Access to the drop off location is from Gate 4 off Pinnacle Arena Drive. Look for directional signage on Pinnacle Arena Drive. Upon receipt of a discrimination complaint, the City’s Ombudsman/Title VI-ADA Co-Coordinator shall evaluate and investigate the complaint. The City’s Ombudsman may seek assistance of the City Attorney in investigating and responding to the complaint. The Ombudsman shall complete the investigation no later than 45 calendar days after the date the complaint is received. If more time is required, the Ombudsman shall notify the Complainant of the estimated time frame for completing the investigation. Upon completion of the investigation, the Ombudsman shall respond to the complaint in writing and follow up verbally if the individual is unable to read the written report. The response will explain the position of the City, and, where appropriate, offer options for substantive resolution of the complaint. 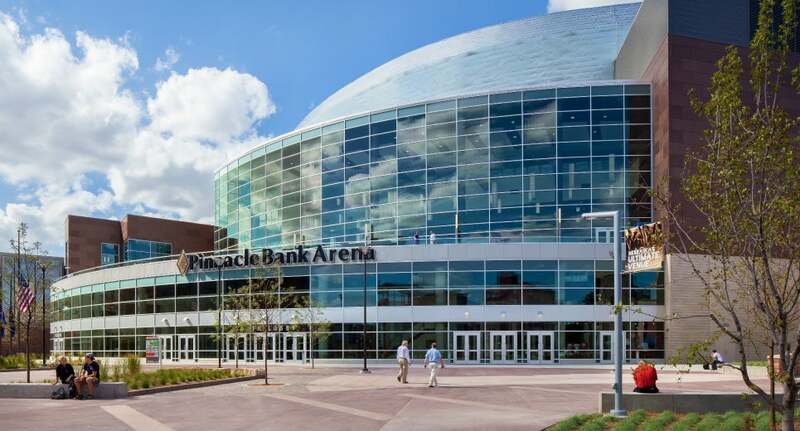 Complaints alleging discrimination against applicants or employees on the basis of disability are addressed by the Director of Equity and Diversity, Kimberly Taylor-Riley, 555 South 10th Street #304, Lincoln, NE 68508, 402.441.8691, [email protected]v.
Pinnacle Bank Arena meets or exceeds all structural and service requirements as stipulated by the Americans with Disabilities Act. Restrooms, drinking fountains, phones, Pinnacle Bank ATM’s and counters are accessible to guests with disabilities.